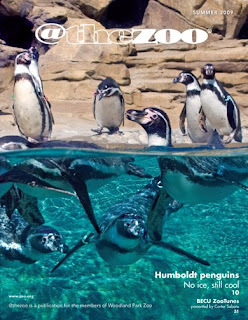 We're super excited to debut a new online feature for our zoo fans: an interactive, multimedia version of our popular member's magazine, @thezoo. You can flip through the magazine online, watch related videos right inside the magazine pages, follow links within the stories and more. Go ahead, give it a whirl and let us know what you think. Check out the latest summer 2009 issue and see how videos bring the penguin story (page 11) and Papua New Guinea conservation story (page 13) to life! Bookmark this page and check back for new quarterly magazine editions, or check out the archive of past @thezoo magazines. And yes, members will still receive the print version. To get your own print subscription, check out these membership options and join today! Saturday was a beautiful day to be in the forest, yanking ivy and mulching new native plants. As part of our Share the Habitat summer experience, the zoo has partnered with EarthCorps to connect zoo visitors with family-friendly opportunities to restore forests in our neighborhood parks. Zoo staff and volunteers joined an EarthCorps event last weekend and we were really impressed with how much could be accomplished in just four hours! Seeing the acres of ivy covering trees and blanketing hillsides in our local parks can feel pretty daunting—especially if you’ve ever tried to remove a small patch from your backyard! But with this well-organized group, the work was fun and very do-able – even for kids. (One of the maintenance areas we worked on had originally been cleared by a group of kindergarteners)! We’re moving buckets of mulch from the main pile down the path to the plant restoration site. This mulch will help keep tender new native plants moist and free of weeds while they gain a foothold replacing the invasive ivy. There are fun volunteer events like this happening all summer. Sign up here. No experience necessary! This is just one small piece of the region-wide effort that is helping to restore forests in our local parks. 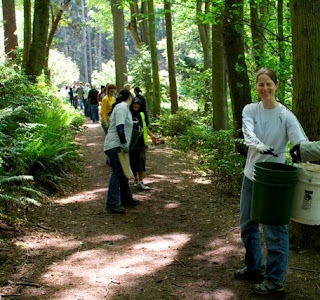 Last Saturday’s event was sponsored by EarthCorps, Earth Share and The Green Seattle Partnership. Up against the lure of TV, video games and computers, it can be hard to get kids to replace screen time with green time. But it’s more important now than ever to help our kids connect with nature, so we can inspire and nurture the future conservation stewards of our planet. Here are some special opportunities Woodland Park Zoo has created this summer to connect kids of all ages with nature and get them involved in real conservation. With eight individual classes offered at Zoomazium during the summer, you and your child will have plenty of opportunities to explore nature themes with stories, puppets, animal contact, and nature exploration. We are very excited to present a day camp theme this year that lets kids discover how they can make a difference in the world and improve their environment. Campers will not only engage in eco-friendly crafts and activities, but they will get hands-on with conservation and join a habitat restoration project in Lower Woodland Park. As a culminating project each week campers will plant ground cover and shrubs and help with the maintenance and protection of this high priority restoration area. This day camp for older kids connects campers with at-home conservation actions, field-based research experience, and conservation leadership skills to help them make a difference in the environment. Campers will take hikes, do nature journaling, explore with GPS and radio tracking devices, learn site mapping, and take on a leadership role in the habitat restoration project with Zooper campers in Lower Woodland Park. The key to inspiring an interest in and passion for conservation in kids is to get them outside and up close with nature. A trip to Woodland Park Zoo, a local park, or even your own backyard can be a great first step, but if your child is ready for the next step, please consider one of these fun summer opportunities! Spaces are still available in other zoo camps as well—see all the summer offerings here. A male red crowned crane brought new significance to Macy's Mom & Me when he hatched out last Friday. The fuzzy golden-brown chick is one of several that have hatched at the zoo. These cranes, also called the Manchurian or Japanese crane and are endangered, with only a few thousand left in their native Central Asian steppe habitat. The zoo currently teams with the Muraviovka Park for Sustainable Land Use in the Amur River region of Russia which works to protect cranes and their nesting areas in the park and work with local farmers to promote sustainable farming practices, instead of the slash-and-burn techniques that have traditionally been used. Looking every bit as fierce as their namesake, rhino beetles (Dynastes granti - AKA the Grant's or Western Rhino beetle) are making their presence known in Bug World. These beautiful American beetles are found in the Southwest and are often found around mercury vapor lights near gas stations. After living as grubs for two-four years underground or in rotten logs, these beetles, olive green with numerous chocolate to brown spots on the wings, emerge to eat pollen, ripe fruit, and tree sap. 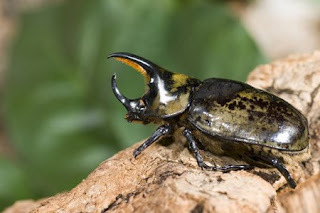 The male beetle has impressive black horns with which he defends the hornless female against other potential suitors. These beetles are at increasing risk of over collection, habitat destruction, and eradication due to increased incidences of wildfires as a result of global warming. Our first two males recently eclosed, the third generation of zoo- bred beetles from ova laid in July 2007. A female pupa is being watched with eager anticipation! Today marked the beginning of the ceremonies to open the zoo's new Humboldt penguin exhibit. Local dignitaries gathered to speak about the sustainability features of the exhibit, the hard work performed by zoo staff and contractors and, of course, about the penguins themselves which frolicked playfully as the speakers made their comments. Also on hand was 13-year-old Harrison Grad who, when 11, donated his birthday money to help towards the building of a new exhibit. Well, now his dream is a reality as donors and zoo members were treated to the opening, cupcakes by Cupcake Royale, music by Quicha Mashis, and, once again, the penguins that delighted everyone in their spacious new pool, complete with underwater viewing. Tomorrow, Saturday, May 2, is the official opening for the general public. Come and check out their new digs, learn about the conservation the zoo supports to help these endangered birds in the wild, and what YOU can do to help them survive.